6/22/15 Due to popular demand and encouragement from my pal Will Tinkham http://willtinkham.blogspot.com/﻿ I am delighted to announce that DEATH AT THE DRIVE-IN will be available in paperback on Amazon next week. Woohoo! Watch this space. 6/19/13 Learned today that an excerpt of my novel, THIS AIN'T NO COWBOY MOVIE, has been selected as one of the top five in Stone Thread Publishing's short story contest and will appear in an anthology in a few months. And I'm getting paid for it! Sweet. 6/12/13 After 8 weeks of revising, including a change of title from The Story of Laurel Blue Stone to This Ain't No Cowboy Movie, I sent it off to the agent who pointed out my penchant for POV violations. Big shout out of thanks to my friend Will Tinkham for his unflagging support and encouragement - with a bit of ball breaking thrown in. And so the next batch of waiting begins. Glad I've got a WIP to distract me. 11/30/12 The fourth installment in my The Dot & Dash Chronicles - Dancing with the Czars - is now up on IMPACTmagazine.us. I hope you'll take a few minutes to read it and have a laugh. Leaving a comment would be nice too. Thanks. 11/29/12 Truly delighted to announce that I revised my manuscript, The Story of Laurel Blue Stone, adding 19K words to the original 58K (now 77K) and wonder why no other agent suggested I increase the word count. A lovely new character just waltzed in in a flurry of activity and I marvel at how I could have thought the book was complete without her. Anyroad, it's been sent off to interested agent and I will resume querying other literary agents but with a lot more confidence now. 10/11/12 An excerpt of my current WIP - NOOKS & GRANNIES - is up on America's Next Author contest and I am hoping a lot of you will read it and leave a brief review. NOOKS & GRANNIES is the story of two young misfits - Keegan, coming to terms with his homosexuality, and Amelia, coming to terms with the fact that she was born 40 years too late and must make do with vintage threads. Not to mention things that go bump in the daytime as well as at night once they move into Keegan's late grandmother's house. Please read and vote [and vote often] Thank you! 10/7/12 Am delighted to announce that I listed DEATH AT THE DRIVE-IN for FREE on Amazon and sold 995 copies on 5 days - nearly 200 copies per day. Wow! I hope all who bought the book enjoy it. Thanks everybody who took advantage of the freebie! 9/17/12 - Delighted to share with you the fact that IMPACTmagazine.us will be running a series of my humorous short fiction from The Dot & Dash Chronicles starting with their inaugural issue today. I wish them enormous success. Here's the link to my first story, UNDAY RUNCH. 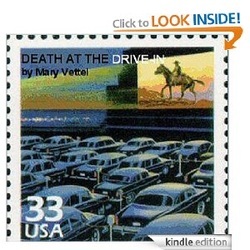 7/18/12: Am very happy to announce the release of my novel, DEATH AT THE DRIVE-IN. The story of baby boomer Billie Jenkins, and how she struggles to reinvent herself when she loses her murder mystery dinner theater without inventing anything embarrassing, like another son. There's humor, intrigue, cowboys, mystery, and more than a touch of romance. If you're a baby boomer or know someone who is, this is the book for you. Here's a link to check it out. Thank you. 7/2/12: Nearing completion of the revisions on GATSBY DELANEY – 7TH GRADE IMPRESARIO. I hope to resubmit it to dream agent any day now. 6/1/12: THE STORY OF LAUREL BLUE STONE has been submitted to the 2012 Tony Hillerman Mystery Contest. 5/27/12: Got an R&R (request for revision and resubmission) of GATSBY DELANEY – 7TH GRADE IMPRESARIO from dream agent. Will take my time and carefully consider suggestions from Query Tracker pals Kimmy, Tigerbunny, Elias, and Augusto before resubmitting. 5/24/12: Like the shortest kid in class not being picked for the basketball team, my manuscript, THE STORY OF LAUREL BLUE STONE, whilst not short, was not picked to move on to the semi-finals of the ABNA – Amazon Breakthrough Novel Award – 2012. Fear not. I shall soldier on. 5/20/12: The first 250 words of my novel, GATSBY DELANEY – 7TH GRADE IMPRESARIO, won the Utica Writers Critique Contest in the MG Fiction category, garnering me a five-page critique by Dorothy Stacy, author of The Erie Canal Cousins series. She loved it! Yay! 5/4/12: Am meeting every other week with Critique Group where I am presenting chapters of NOOKS & GRANNIES with characters Keegan & Amelia and spooky developments on the horizon. 5/4/12: Am meeting twice weekly with fellow writer and new friend, Janet, to edit her wonderfully poignant novel that touches on the guilt of a Holocaust survivor and what freedom means to different people. ABNA - Amazon Breakthrough Novel Award 2012. I am a quarter-finalist in the ABNA. I submitted a 3,000-word excerpt from my contemporary, multicultural,gritty Young Adult novel, The Story of Laurel Blue Stone in February. By March 20th they had whittled the thousands of entrants down to 500 in each category - General Fiction and YA. On April 24th they will reveal who moves on to the semi-finals. *fingers crossed* The winner gets publishing contract with Penguin Books and a $10K advance against royalties. I'm excited to announce that my friend (and co-author of our children's picture books and songs) Beddy Piekiel has released her new CD of beautiful lullabyes for wee ones (and one very special poodle). 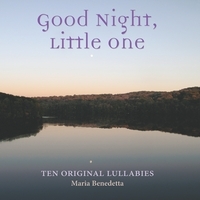 Please go to www.CDBaby.com where you can listen to, buy, or download the CD Good Night, Little One by Maria Benedetta. The album contains 10 tracks of heartwarming lullabyes that will do the trick is easing your little one into slumberland. It makes a great gift for anyone at nap or bedtime.